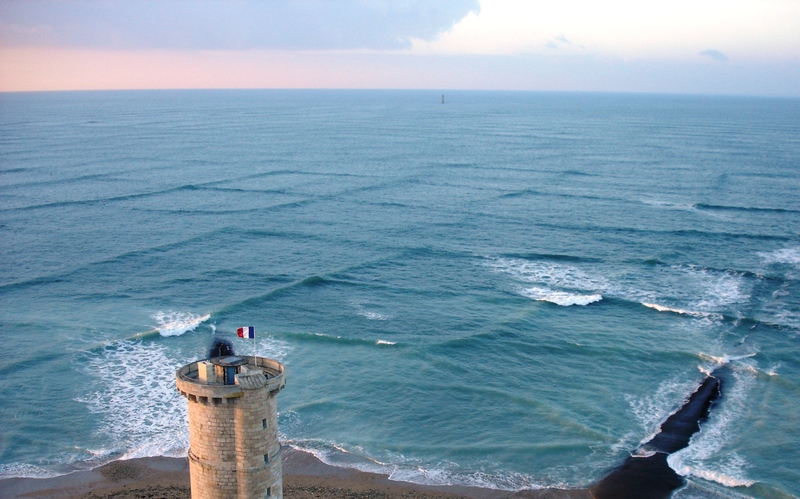 Another of those great images of sea phenomena that I like, cross (or grid) waves, which occur when two sets of waves travelling from different directions cross at an angle of 45° or more. This creates very steep short-crested waves that can be dangerous for shipping. From the European Space Agency. Put some Channel Swimmers out there, you could have a game of Sea-Chess and get some good training in. EDIT March 21st 2013: This post is getting a hammering from people that don’t believe this is real. Please check the comments for my update & explanation (that it is genuine and how it can be caused), and also a way for you to check the photo for yourself, if you believe the European Space Agency (and I) are lying to you. Here’s video of a similar phenomenon on a beach. The result is the same but the cause here is probably angled sandbanks causing wave refraction where waves wrap around an object because one end of the wave gets slowed down by shallower water. Wave refraction is what causes such famous surfing breaks as Malibu in California or Jeffrey’s Bay in South Africa. This is an amazing phenomenon that can occur when swells from storm systems collide in exactly a 90 degree angle creating these grid patterns. Mer gaufrée (wafled sea) https://fr.wikipedia.org/wiki/Vague ? This is awesome! Where on the French coast is this? This is a cool pic, but was obviously photoshopped, as the pattern defies the laws of physics. This isn’t obviously photoshopped. Waving the phrase Laws of Physics doesn’t mean anything without specifics. Just because someone doesn’t believe something doesn’t mean it doesn’t exist, any more than believing something means it does exist (UFOs & Conspiracy theories). You can check the image for photoshopping yourself at fotoforensics.com using ELA, but there’s no evidence of any manipulation of the JPG using Error Level Analysis. images at different places around the world such as the Gibraltar straits. All that is required are two low pressure areas at about ninety degrees to one hundred and twenty degrees opposing to generate each swell and with no land or opposing weather patterns in between. Would you like some iced aloe vera cubes to go with that burn Timothy? It reminded me more of Battlefield than of Chess though!